Police Procedurals (1985), edited by Martin H. Greenberg and Bill Pronzini, is the second volume in the Academy Mystery Novellas series. For this series Greenberg and Pronzini chose works by respected crime fiction writers--most works which had never appeared in anthologies before--and organized the novellas into editions based on sub-genre. As the title indicates, this collection brings together four novellas that give us a taste of police procedure as envisioned by Ed McBain, Donald Westlake, Georges Simenon, and Hugh Pentecost. 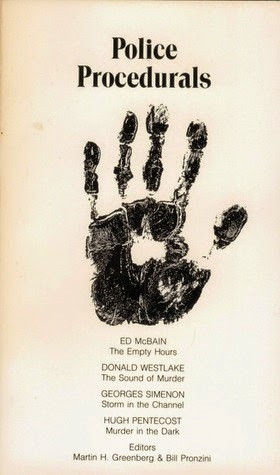 McBain's work, The Empty Hours from 1960 has the Steve Carella and the men of the 87th Precinct investigating the death of a woman found dead in a cheap apartment. From the beginning, things are not what they seem. The woman looks like an African American to the officers first on the scene, but she proves to be Caucasian--blackened and bloated by the intense heat and rapid decomposition. They assume she was a woman down on her luck--but her clothes prove to be more expensive than her surroundings would warrant and her bank account is nice and full. As they check up on her, they find that she was Claudia Davis, a wealthy young woman with a generous trust fund. They also learn that her cousin had come to stay with her not so very long ago, but more recently had died in a boating accident. Now both women are dead. But why? And what happened to the missing $5,000 from her safe deposit box? This is an excellent procedural--very descriptive writing, but not so much of a puzzler and very little misdirection. The Sound of Murder (1960) by Westlake is the story of a young girl who seems mature beyond her years who comes to Detective Abraham Levine in Brooklyn's 43rd Precinct to accuse her mother of murder. Amy Thornbridge Walker is positive that her mother has killed her step-father with a "loud noise" (he suffered from a weak heart) and wouldn't be surprised if she hadn't done in her father as well. She has no proof to offer the detective--just her calm assurance that it happened. Levine, who suffers from a bit of heart trouble himself, begins to believe there may be something to the girl's story and sets out to investigate. But as with the first story, everything may not be quite as it seems. This one is nicely done with a clue planted right in front of the reader but so subtly it will probably be overlooked. Simenon's Storm in the Channel (1944) sees now-retired Superintendent Maigret setting off with his wife on holiday to England. But a storm in English Channel prevents their crossing and they take refuge in boarding house. Maigret finds himself on something of a busman's holiday when the maid is found shot to death after helping one of the other boarders carry luggage down to the boat. The local detective thinks the retired policeman may be past it, but Maigret soon proves that he can read clues in a menu with dress measurements doodled on it. It isn't long before the detective has a confessed murderer in charge. This is straight deduction and Maigret makes the most of the few clues he finds. Murder in the Dark (1949) by Pentecost takes its name from the unusual diamond-buying procedure described in the story. Buying "in the dark" involves a diamond broker obtaining an allotment of rough diamonds with a set amount of carats and agreed upon types [there are various types of rough diamonds] but without seeing the actual stones. The sealed packet is then sold to a customer who is gambling on whether the stones will cut properly and be worth what she or he paid for them...or, hopefully, worth even more. A recently wealthy man comes to New York City to buy diamonds and, being a gambler by nature, decides to buy them in the dark--but before the night is over the man is dead and the diamonds have disappeared. The story turns into a Maltese Falconish tale--with people crawling out of the woodwork looking to find those diamonds. It's up to Lieutenant Pascal to figure out who thought the stones worth killing for and where those gems might be. Fairly good story albeit with one of the main suspects running in and out of the police investigation in a rather improbable way. 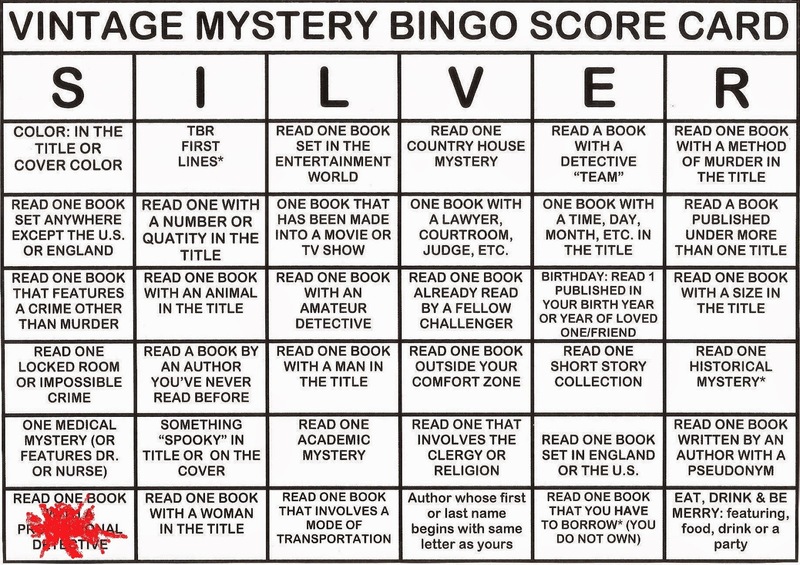 This fulfills the "Professional Detective" square on the Silver Vintage Bingo card. Sounds like a good collection. I'm definitely intrigued by The Sound of Murder, sounds like a great thriller! Fab review! I was about to say you must really love mysteries when I saw that your mascot/avatar had a magnifying glass haha (: ~ Good luck with your other state reads. I hope you enjoy your books even more as the month goes on. Oh, yes, Adriana--I am a mystery junky. I read all sorts of things--but mysteries are my go-to genre.